He helped her and asked for nothing in return. She made it a mission to repay his selfless favor. Kate McClure was driving on I-95 in Philadelphia last month when she ran out of gas and had to pull over on the side of the highway. Nervous, she began to walk in search of the nearest gas station. RELATED:How easy is it to use a viral crowdfunding campaign to steal people's money? That's when Johnny, who stands on the side of the highway with a sign asking for help, approached her. He instructed McClure to get back in her car and lock the doors. Johnny, who is homeless, eventually returned with a red can of gas he bought with the little money he had. 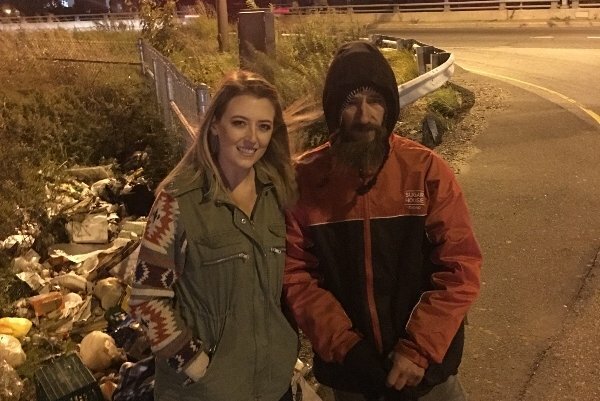 McClure couldn't give him anything in return at the moment, but felt the need to repay Johnny, and began stopping by his usual spot on I-95 with clothes, food and money. Each time, Johnny was incredibly grateful; at one point, she brought him cereal bars, and he asked if she wanted one. But it still didn't feel like enough. "I wish that I could do more for this selfless man, who went out of his way just to help me that day," McClure wrote on a GoFundMe campaign page. "He is such a great guy, and talking to him each time I see him makes me want to help him more and more." So she started an online fundraiser with an ambitious goal of $10,000. As of Tuesday afternoon, the campaign has raised more than $12,000. “It just blew up,” McClure told NJ.com. In a recent video from McClure, Johnny can be seen reacting to the fundraiser taking off and raising more than $1,700 in just a few days. "That changes my life right there," Johnny says in the video. Johnny, 34, said he had been in the Marine Corps and was once a licensed paramedic. He moved to Philly a year ago with a job lined up and money to buy a truck, but that all fell through and he ended up on the streets. McClure, 27, and her boyfriend, Mark D’Amico, hope to help Johnny not just with the money, but also by helping him find housing and vouching for his character to potential landlords, NJ.com reported. Johnny plans on trying to get a job at the Amazon warehouse in Robbinsville, New Jersey, and eventually wants to be re-certified as a paramedic in either Pennsylvania or New Jersey. Thanks to a chance encounter and his own selfless generosity, that dream may very well become a reality.